Settle down with our Calming Aromatherapy Kit. Add your favorite chair (or one of ours), and you have everything you need to relax if you are feeling tense, over stimulated or stressed. 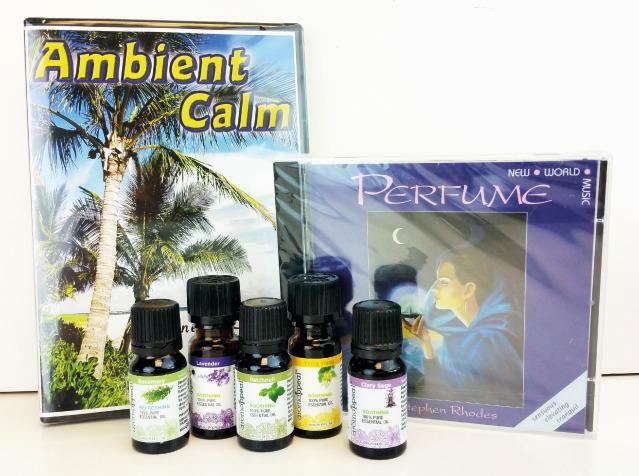 Included in this kit are the Ambient Water DVD, Calming Aromatherapy Oil Kit, and Perfume CD. Ambient Water DVD includes 190 minutes of the most amazing saltwater and freshwater aquariums around, eleven scenes (10 to 30 minutes each), loop scenes for continues play, aquarium sound effects and music, freshwater, saltwater and coral reefs. Calming Aromatherapy Oil Kit includes proven scents to calm a troubled mind; Rosemary, Lavender, Ylang Ylang, Patchouli, Clary Sage. Perfume CD is a collection of serene and sensitive compositions that gently guide you towards a state of stillness and inner calm. (52 minutes).